100% natural, skin free patch containing plant-based essential oils of that can be stuck virtually anywhere, anytime to for a blast of extra strength aromatherapy. 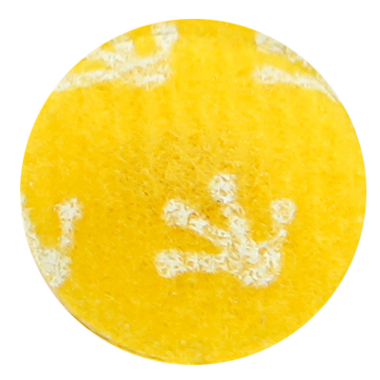 The unique blend of citrus and lemongrass essential oils in each patch release a pleasant floral aroma that provides 6 hours of continuous fresh air for the entire family, including pets. 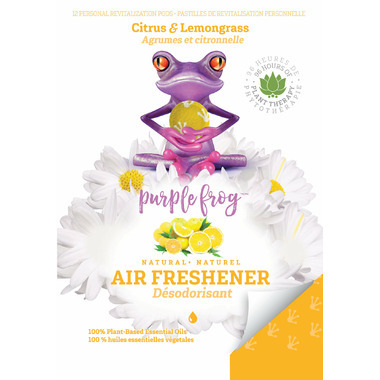 Purple Frog's Aromatherapy pods are a safe and easy-to-use alternative to messy chemical sprays and lotions for home, the outdoors, travelling and even while you sleep. Clean, fresh air so you can breathe easy knowing you aren't inhaling any toxins! How to Use: Peel, pop and stick on any surface to naturally freshen air for 6 - 8 hours. Ingredients: Lemongrass Oil, Citronella Oil, Cedarwood Oil, Geranium Oil, Rosemary Oil, Peppermint Oil, Orange Oil, Lemon Oil.